This blog is written and managed by the Charlevoix Area Chamber of Commerce. Charlevoix is a popular destination spot for year-round travelers. Your visit and stay is important to us, and this blog is here to give you the inside scoop into community events, family friendly activities, popular local hotspots, new attractions in the area, historical trivia, and more! However long your stay may be, we hope to give you plenty of worthwhile ways to spend your time in Charlevoix The Beautiful! Last week you read about activities for kids to do in the sunshine, but what about the days when it pours down rain? Rather than staying indoors all day, here are ten ways to fight the boredom and the blues if your vacation is a rainy one. Be sure to check out our website for our full business directory and other activities to do in Charlevoix. For more information click HERE. 1. Visit the Charlevoix Public Library! Come hang out at the library and check out some summer reading material in the extensive children and teen/young adult sections! Visit the Charlevoix Public Library calendar of events to check out what's happening for youth. 2. Catch a movie at Cinema III! When the weather is wet and cloudy head to our cinema and enjoy a movie with a big bowl of popcorn and fountain beverage, or create your own smoothie! The Minions have hit Charlevoix Cinema this week! Watch your favorite funny yellow characters get themselves in and out of all kinds of trouble with plenty of laughs. Check out their website for the schedule of showtimes. 3. Get creative at the Circle of the Arts! The Charlevoix Circle of the Arts is a nonprofit organization promoting the visual and performing arts. They house many fine art exhibits, creative camps, and classes for youth ages 5-18! Whether you're learning a dance or theater techniques, making a sculpture, or baking tasty treats, you are sure to have a wonderful fun-filled time. Check out their website for the detailed listing of creative camps and classes. 4. Explore the Raven Hill Discovery Center! Stop by the Raven Hill Discovery Center to participate in hands-on activities that connect science, history, and art! Visit the giant tortoise and slithering snakes, and explore the indoor and outdoor museums and exhibits on the second Saturdays of each month for free! 5. Visit the Harsha House Museum! Journey through the perils and periods of Charlevoix's history at the Charlevoix Historical Society's Harsha House Museum! There are many exhibits and artifacts on display such as: Ernest Hemingway’s original marriage license with first wife Hadley Richardson, a 1920s working player piano, panels of mounted historic photographs, an eight-foot tall 200 story Petoskey Stone tower made for the Bicentennial of 1976, and much more! 6. Drive around the Mushroom Homes! You may have heard of the infamous Earl Young homes, often called Mushroom Homes. Their unique stonework and curved roofs give each home the appearance of a mushroom or hobbit house! Look closely and you may see Froto inside. Each home is privately owned, but welcomes driving and walking tours through the unique neighborhoods. Perfect for a rainy day drive! 7. Visit Rocking Horse Toy Store! The Rocking Horse Toy Company is located at 220 Bridge Street and is stocked with games, crafts, and fun toys that the whole family will enjoy! While on Bridge Street, you may want to check out several other shops and storefronts if the skies are gloomy. For our full business directory, click HERE! 8. Decorate a cupcake at Cre8tive Cupcakes! Dodge the gloomy weather and head in to the bright and cheery Cre8tive Cupcakes for an extra special sweet treat! Treat your kids and yourself to delectable gourmet cupcakes, cakes, and other baked goods along with specialty coffee! Grandma Pat's Tea Room is equipped to host small parties and events, and check their calendar to find out when the next cupcake decorating day is! 9. Get your sugar fix at the Taffy Barrel! The days of penny candy and 23 cent gas prices may not be around anymore, but the look and feel of the general store is still found at the Taffy Barrel candy store! With over 150 barrels of taffy and old fashioned candies, and jelly bean bar, the Taffy Barrel will surely indulge your sweet tooth. 10. Head to the indoor Charlevoix Community Pool for Open Swim! Too gloomy for the beach? Head to the Charlevoix Community Pool for open swim! The pool is open on designated days for open swim and dollar night. 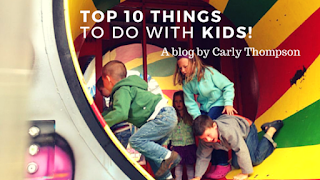 Top 10 Things to do with Kids on a Sunny Day!